We have had our house in Hungary for over 13 years. And today, one of the final puzzle pieces in our renovation was completed: the water gutters in the front of the house over our porch and over the cellar entrance were installed. I know, I know. To you, dear reader, gutters are about as exciting to you as someone pulling out 1,789 pictures of their grandchildren then telling you 976 amusing antidotes about what they had for breakfast. To you, unbuttered toast is probably more exciting. But this really is a milestone for me. Since it took 18 months to get competent roofers to get our roof redone, and then a year to renovated and replaced the roofing over our front door porch this fall (a project I ended up doing myself) getting all the pieces finalized to me is a culmination of a process that really is nice to see finally completed. Note: in part the long time frame was my cause as I demanded the best craftsmen I could afford and they were understandable in demand and I had to wait my turn for their time. But I have learned, especially in Hungary, it is worth getting the best you can afford so you do not have your “new” construction falling apart in a few short years. 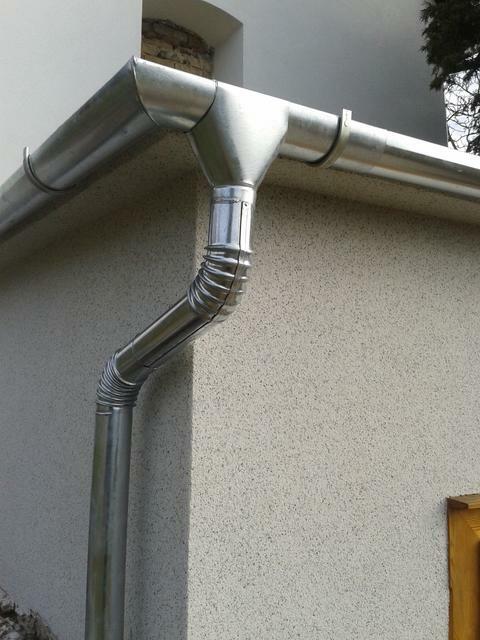 Now, to someone who always had water gutters this entire post may seem completely mundane. But these gutters are a new addition and in the perspective of an old house, this is important. Unlike most of the work on our house to date, which has been basically renovating back to an original condition as much as possible, the new gutters will serve a very important function: they will protect our newly renovated walls from water damage. It is an unfortunate but simple fact that I find many old Hungarian houses do not have sufficient water diversion. In fact, I would suggest that one of the major failings in Hungarian home ownership of older houses is not understanding the affects water has on the house. 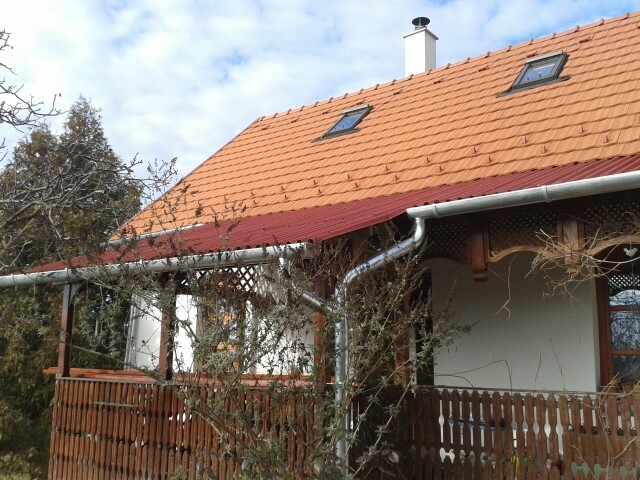 There are too many houses in Hungary that suffer from moisture creep up their walls; mostly due to failing to move water away from the foundation. This was also true of our house when we first purchased. We spent the first two years of ownership simply drying out the house, mainly by digging drainage around the house to lead water away from the foundation. The final piece of that long process is now complete. Overall, I am not immune to the fact this is a fully first world topic to waste time celebrating. And I understand that if you spend too much time on any issue you tend to over accentuate the trivial. Yes, I know and understand all that. But protecting a house foundation I think is pretty darn important for a structure that, if properly cared for, should outlive me. But of course, knowing my Karama, once I install rain gutters the universe will kick back and it won’t rain here now for months. Even so, and despite that, to celebrate I think I will have a glass of wine.